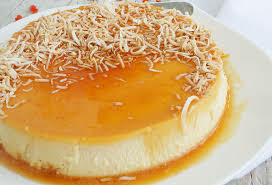 Flan De Coco (Coconut Custard) - Tienditadepuertorico.com - Buy Puertorican Food Here!! 1 Pre-heat oven to 325 F.
boiling water to come halfway up sides of dish. Transfer baking pan to oven. dish. Swirl dish until sugar evenly coats bottom; let cool. dish. Transfer to hot-water bath in oven. on top of flan and invert. Slice, and garnish with any remaining syrup.